Available at the Gift Shop or may be purchased at the front door of the Inn. 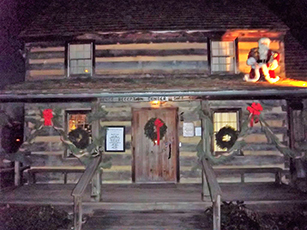 One of Kingsport’s most beautiful historic sites will celebrate the Christmas holidays in traditions that date to the early 1800’s when Richard and Margaret Netherland hosted friends and family for a lavish party complete with wonderful decorations, good food, and lively music. The event will culminate the year-long 200th anniversary celebration of Richard Netherland’s purchase and opening of the Netherland Inn in 1818. 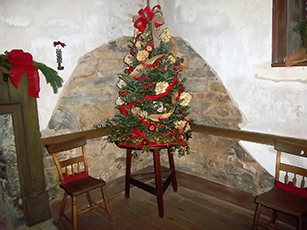 Local Garden Clubs and volunteers for the Inn have decorated every room plus the school house and Bank Barn / Transportation Museum with period decorations and greenery. 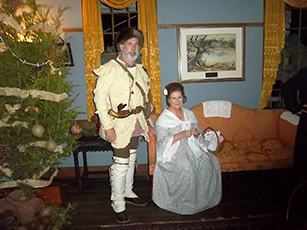 Docents in period dress will serve food and drinks in the dining room of the Inn, with hot cider available in the tavern, school house and Bank Barn. You will love the delicious offerings set in the charm and holiday smells of the Inn. Friday and Saturday night will bring Civil War re-enactors from the John S. Mosby Camp, Sons of Confederate Veterans to portray living history characters from the area and interact with guests as they tell about the Inn’s role in the Civil War. 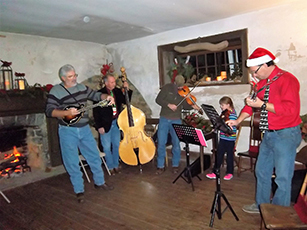 Paul Brummitt and Alexander Creek will perform on Friday night; Poplar Hill Reunion Band will be featured on Saturday night; and harpist Christa Wenger will entertain on Sunday afternoon in the Tavern. Make plans now to attend these celebrations to enjoy the beautiful period natural decorations designed and provided by Kingsport garden clubs and volunteers; to partake of delicious food, and to hear seasonal music. Visit with living history characters from Kingsport’s past. All proceeds from this event go toward maintenance and restoration of the Netherland Inn and Boatyard Complex as well as adding to the historic campus. In addition to being the birthplace of Kingsport, the Netherland Inn is the only site on the National Register of Historic Places to have been both a boatyard and a stagecoach stop. For more information please call 423-677-3263 (Netherland Inn).